Description: Burlington Northern Railroad GP50 3113 at Clyde, Illinois on July 24, 1987, Kodachrome by Chuck Zeiler. 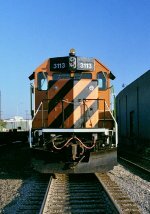 Description: Even if its rebuilt as a GP39. Gotta love that brow over the cab. This one has 59 cars in tow rolling west.